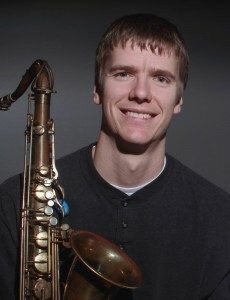 Using a wide array of extended techniques on the tenor saxophone, Derek Brown will perform a mix of original and cover tunes with a singular “beatbox” feel. Crossing genres from jazz to funk, saxophone innovator Derek Brown’s unique playing style, using creative, new “beatbox-like” techniques, has wowed audiences across the globe. Previously the director of jazz studies at Abilene Christian University for the last six years, Derek now lives and performs in Chicago, playing in various bands and projects throughout the area. His recent BEATBoX SAX music videos and weekly tutorials on YouTube have been very popular among saxophonists and music lovers alike. Using a wide array of extended techniques on the tenor saxophone, Derek Brown performs a mix of original and cover tunes with an original “beatbox” feel. These extended techniques (which include traditional elements like slap tonguing and multiphonics, and more original elements like tongue ramming, pitch-less pops, and “scratch” sound effects) combine with Derek’s inventive contrapuntal bass lines and melodies to create the illusion of multiple performing musicians. No looping or electronic effects are used.